I just realized it's been a while since I've shared my Citrus Tree Studio kit projects. For the month of July I had the pleasure of working with the Palmetto Summer kit featuring the Pink Paislee Queen Bee line. At first I was really worried working with a 6X6 paper pad as my base patterned paper but I actually got 4 wonderful projects out of it with paper to spare. This first project is for my July "alter it" challenge. I bought a plain little wooden birdhouse at Michael's for about 2 bucks and then added patterned paper, embellies, and a clock. I think it's one of my favorite projects to date. Next is just a fun layout of me and Gabe's day together while Dave was away. I misted the background with green Smooch Spritz and brown Maya Mist. Another little altered project, a canvas. This is the 8X8 Home Basics canvas for sale over at Citrus Tree as the product spotlight. I used gesso and Smooch Spritz as the base and then layered the paper and embellies over the top. Finally, this is my last layout. 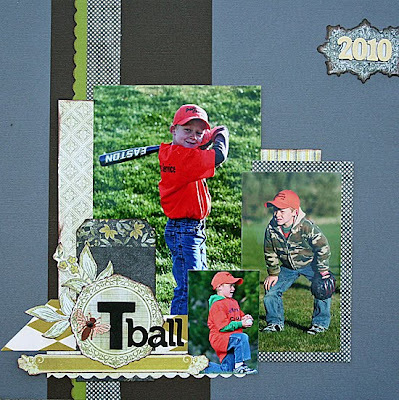 I wanted to stretch myself and use the gorgeous patterned paper with a masculine subject...T-ball. It worked. 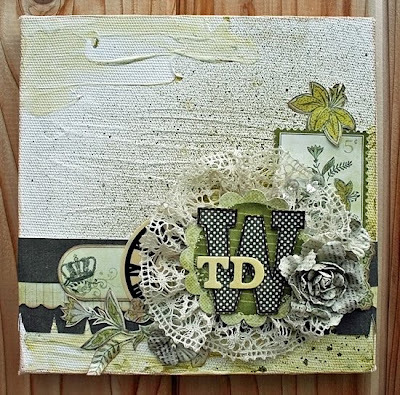 Awesome projects, Tammy!! That layout with the photo of you & Gabe is just perfect! 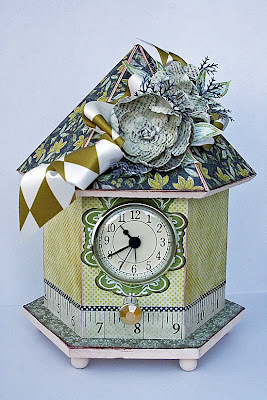 Your projects are stunning Tammy, I really love the bird house. Im using Queen Bee for Dreamer this month. Totally in love with all of these Tammy!